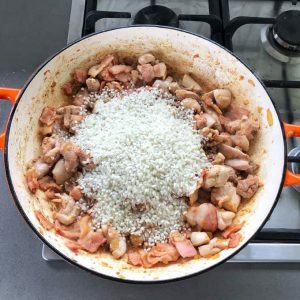 This baked chicken risotto is so easy because the oven does all the work for you, my young sons love this family favourite. 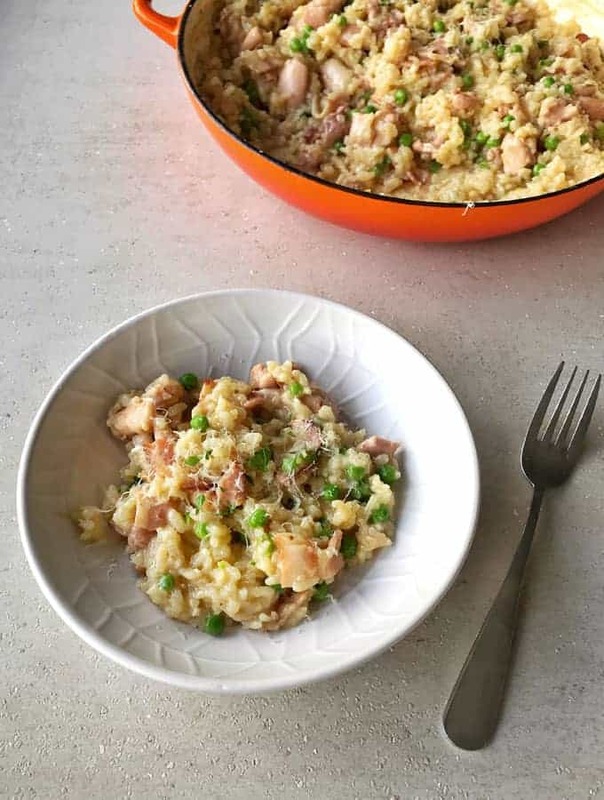 This baked chicken bacon and pea risotto is one of my favourite family dinners. 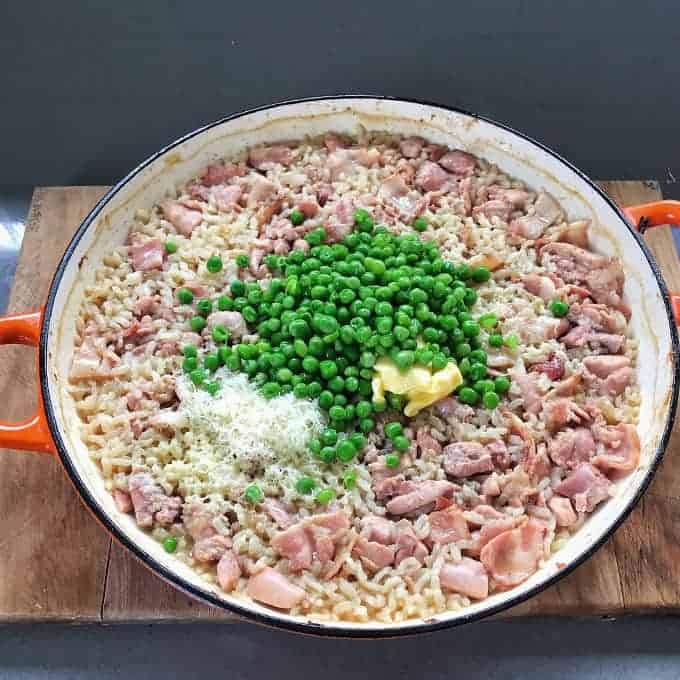 The combination of the chicken and bacon go so well together and the peas give it a nice touch of green to finish it off. 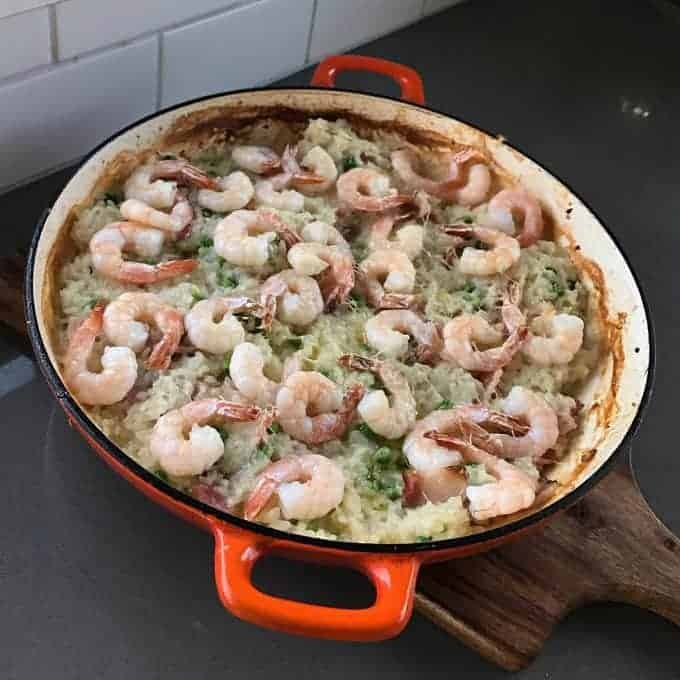 This risotto is baked in the oven so it takes the hassle out of standing at the stove and stirring the whole time like you would with a standard risotto. 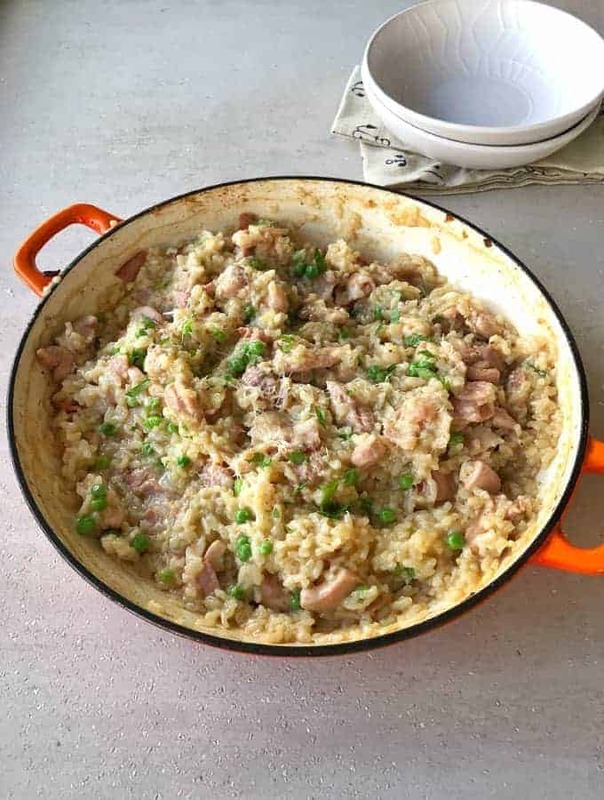 I like to use chicken thighs for this recipe because they stay nice and moist once cooked and won’t dry out like chicken breast can. This recipe is started on the stove top by sautéing onion and garlic then frying the bacon and chicken until browned. 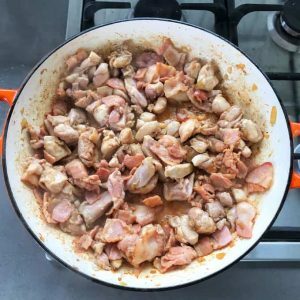 You don’t need to cook the chicken all the way through as it will cook again in the oven with rice. This risotto just needs to be stirred once halfway through cooking. I finish it off with butter, parmesan and then the peas, garnish with parsley and extra grated parmesan. 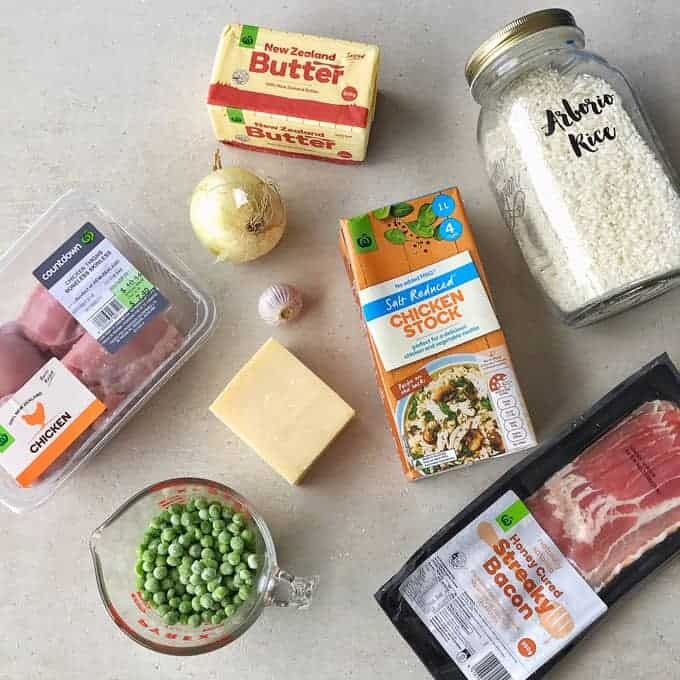 You can put your own spin on this recipe by adding different meat or protein, in this photo I have left out the chicken and bacon and added prawns and peas. You could also make it vegetarian and use mushrooms just brown them at the start in place of the bacon and chicken. For the prawn version I just placed the raw prawns on top of the risotto and put them under the grill for the last 10 minutes of cooking, until they were pink and cooked through. 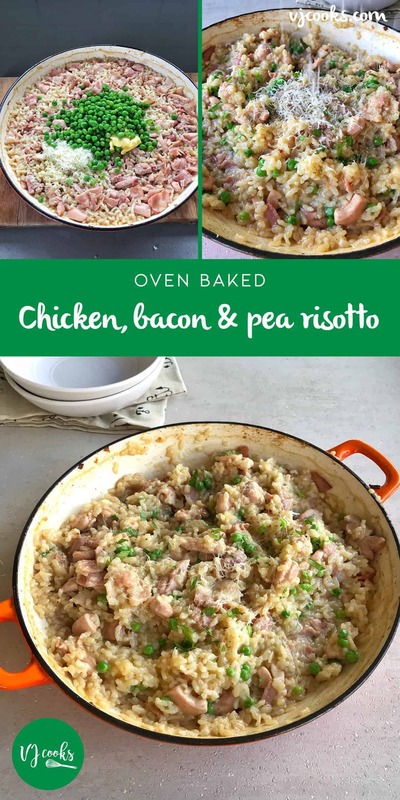 This is a great family recipe and my two young sons love it, it’s always so good when you put effort in to dinner and your kids eat it all. In an ovenproof dish sauté onion with oil for a few minutes, add bacon and brown. Add crushed garlic and chicken thighs then stir until chicken has browned. Add rice and pour stock in slowly while stirring it all together, cover and put into oven. Cook for 35 minutes stirring once halfway through cooking. Remove from oven and add butter, parmesan and peas. Fold together until butter has melted. Season to taste, garnish with parsley and more parmesan.